The Chalcolithic, "copper" period or Copper Age, also known as the Eneolithic or Æneolithic (from Latin aeneus "of copper"), was a period in the development of human technology, preceding the Bronze Age, before it was discovered that adding tin to copper formed the harder bronze. The Copper Age was originally defined as a transition between the Neolithic and the Bronze Age. 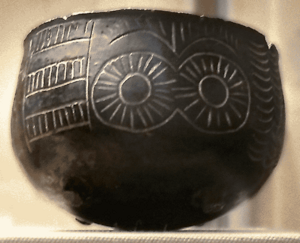 The archaeological site of Belovode on the Rudnik mountain in Serbia contains the world's oldest securely dated evidence of copper smelting from 5,000 BCE. The multiple names result from multiple recognitions of the period. Originally, the term "Bronze Age" meant that either copper or bronze was being used as the chief hard substance for the manufacture of tools and weapons. In 1881, John Evans, recognizing that the use of copper often preceded the use of bronze, distinguished between a transitional Copper Age and the Bronze Age proper. Analysis of stone tool assemblages from sites on the Tehran Plain, in Iran, has illustrated the effects of the introduction of copper working technologies on the in-place systems of lithic craft specialists and raw materials. Networks of exchange and specialized processing and production that had evolved during the Neolithic seem to have collapsed by the Middle Chalcolithic (ca. 4500-3500 BCE) and been replaced by the use of local materials by a primarily household base production of stone tools. The emergence of metallurgy may have occurred first in the Fertile Crescent, where it gave rise to the Bronze Age in the 4th millennium BCE (the traditional view), though finds from the Vinča culture in Europe have now been securely dated to slightly earlier than those of the Fertile Crescent. According to Parpola, ceramic similarities between the Indus Civilization, southern Turkmenistan, and northern Iran during 4300–3300 BCE of the Chalcolithic period (Copper Age) suggest considerable mobility and trade. The literature of European archaeology, in general, avoids the use of 'chalcolithic' (the term 'Copper Age' is preferred), whereas Middle Eastern archaeologists regularly use it. 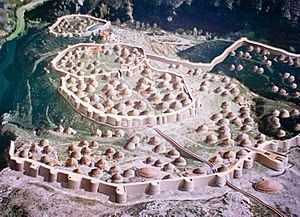 The Copper Age in the Middle East and the Caucasus began in the late 5th millennium BCE and lasted for about a millennium before it gave rise to the Early Bronze Age. The transition from the European Copper Age to Bronze Age Europe occurs about the same time, between the late 5th and the late 3rd millennia BCE. Copper Age Facts for Kids. Kiddle Encyclopedia.